I believe that everyone has heard of Baklava filled with nuts (usually walnuts), but this recipe is a bit different. It is the Serbian version of the popular recipe for this sweet dessert, very common in the Balkans. Beat eggs with 100g of the sugar. Add flour to mixture. In a separate bowl cream 150g of the butter with the remaining 100g sugar. Add creamed butter/sugar mixture to egg mixture and mix well. Melt the remaining 50g butter. Place 5 phyllo sheets into greased baking tray. Brush each sheet with melted butter. Pour filling over phyllo sheets and cover with remaining phyllo sheets, brushing each sheet with melted butter. Bake at 200 degrees C (400 F) for 45 minutes. In a medium size saucepan bring water, sugar and lemon juice to a boil. Boil on medium heat for 10 minutes. Cool to room temperature and pour over baked baklava. Baklava is commonly served in Bosnia, not Serbia. DISGUSTING! If you want to know how to make this ask a Bosnian. I have not tried this particular recipe but a correction to the comment by Alma above - baklava is very common all over the Balkans, especially all of the former Yugoslavia; it is by no means unique to Bosnia alone. I am Serbian and I love baklava, just not this recipe. I agree with Katarina, I am Croatian and we make delicious baklava. I haven't tried this recipe but if I did I would definately add walnuts and golden raisins, Yum! it is very funny how some people comment without common knowledge of history. 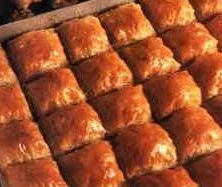 Baklava is originaly Turkish and Arabian dish, not Bosnian, and it is made across the Balkans (from Greece to Serbia, FYRM, BIH, Croatia and Slovenia). I am Serbian from Herzegovina and my grandmother from Serbia/Belgrade was making the best baklava ever, and she was not from BIH, nor she was muslim. So please leave politics out of recipes, or at least learn history. XCUSE ME!!!! Baklava from Bosnia? Baklava is well known all over the Balkans & the Middle East. Greece/Serbia/Bulgaria/Turkey/Lebanon/Syria/Egypt etc...in the Middle East also Christians and Jews eat Baklava...so the comment from ALMA that baklava is supposed to be eaten only in Bosnia is incorrect, get a life!! I know I am young but I made this and used this recipe for a school assignment and got an A+. In Canada, I always find it dry and not appealling. The best baklava I have ever tasted was in Sarajavo and Split; I would like to learn that recipe.